Since opening in June 2009, ZenKitchen has quickly established itself as not just one of the hottest vegan spots around, but one of the hottest tables in all of Ottawa. It’s not only the delicious food that is noteworthy, but also the way that Chef Caroline Ishii has contributed to bringing vegan cuisine to a mainstream audience. On any given day its tables are filled primarily by omnivores. While I wish everyone was vegan, every vegan meal that’s eaten is one less meal that involves the use and abuse of animals, and ZenKitchen has certainly done its part to reduce the number of animals being consumed in Ottawa. 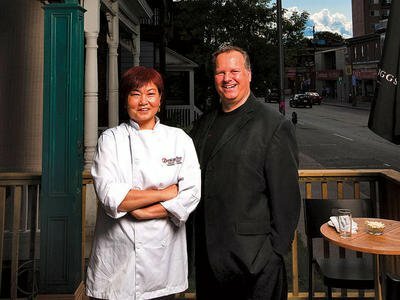 ZenKitchen has received a lot of press and accolades for its innovation, including a 12-part television series called The Restaurant Adventures of Caroline and Dave that aired on the W Network last winter. But it hasn’t gone to their heads. True Ottawa veg superheroes, Caroline Ishii and Dave Loan. They recently received another boost when Caroline was invited to participate in the annual “Gold Medal Plates” competition in Ottawa on Nov. 16. Gold Medal Plates is a celebration of Canadian Excellence in cuisine, wine, the arts and athletic achievement, that occurs in eight Canadian cities. It features superb wines and the premier chefs in each city, paired with Canadian Olympic and Paralympic athletes, in a competition to crown a gold, silver and bronze medal culinary team in each city, and subsequently nation-wide. Remarkably, Caroline was one of the first female chefs ever to be invited to participate in the competition. She was also the first vegan cuisine chef. She was one of ten local chefs invited last spring. And not only did she participate, she won them over, taking the event’s silver medal, in an event that typically favours heavy usage of cream and animal bodies. The dish? Start with a little kale, sautéed and seasoned with a plum-kombu vinaigrette. On top of that sits a polenta cake, crispy outside and creamy inside. 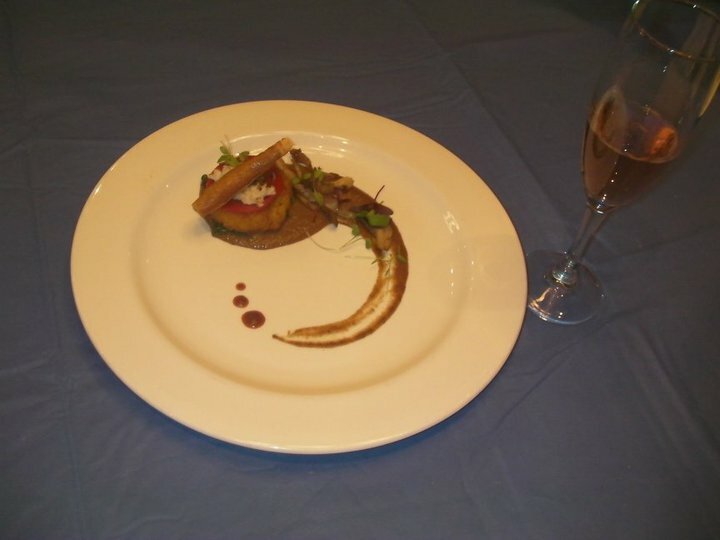 The polenta is topped with a thin disk of red pepper aspic. Add a teaspoon of fermented nut cheese, bruléed with a torch, and then place a “cigar” of more nut cheese wrapped in fried and smoked yuba (the skin that forms when cooking soya milk). A chile-mushroom sauce is swirled from the base of the polenta across the plate, and sautéed exotic mushrooms from Le Coprin are added to it. Three dots of spicy passila chile sauce finish the plate. The ingredients – nut cheese, yuba, vegan aspic – all offered something new to most of the judges, and there was a range of textures, from crispy to chewy to creamy, tastes and colours. 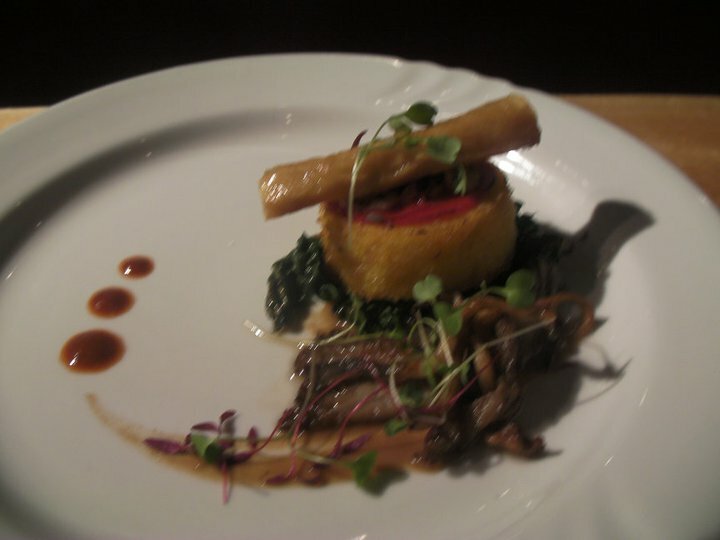 The chile sauce and aspic were bright red elements against the yellow polenta and brown mushrooms. This may not be something to try at home! So what’s next for Ottawa’s hottest meal ticket, which also happens to be vegan? They’re offering take-out now, and doing a bit more catering. “We’re also trying to develop some new products for take-out and retail. Eventually, we’d like to move into a slightly bigger space, but that might be a long time coming and would be dependent on investors,” Chef Ishii says. For now, they’re simply focusing on the restaurant and ensuring the food and service are at the level they want. There are also some special events being planned: two seatings at New Year’s Eve, a Winemaker’s Dinner with Ravine Winery’s Shauna White on February 9, and of course Valentine’s Day! And who knows, maybe ZenKitchen will be invited back to Gold Medal Plates next year! Previous PostEating at La Belle VerteNext PostAnother Awesome NCVA Potluck! Woohoo! Congratulations Caroline and Zen Kitchen….think they’ll be offering the winning dish at the restaurant? The dish will be part of our New Year’s Eve menu, both the 4-course early seating and the 6-course late seating.